When OSU turned the ball over on downs on fourth-and-3 late Saturday against Baylor, there wasn’t exactly a high amount of confidence that OSU’s much-maligned defense — which absolutely melted late against the Bears — was up for a stop. Turns out, it wasn’t. New DC Jim Knowles is shouldering the blame for what happened less than 90 seconds of game time later, but no longer making excuses. Credit Knowles for not reaching in the grab bag for an easy excuse about OSU’s defense. It has been one of the biggest flaws, inexplicably, of this team all season. Saturday against OU is a chance for a big bounceback, but unquestionably its biggest test to date. 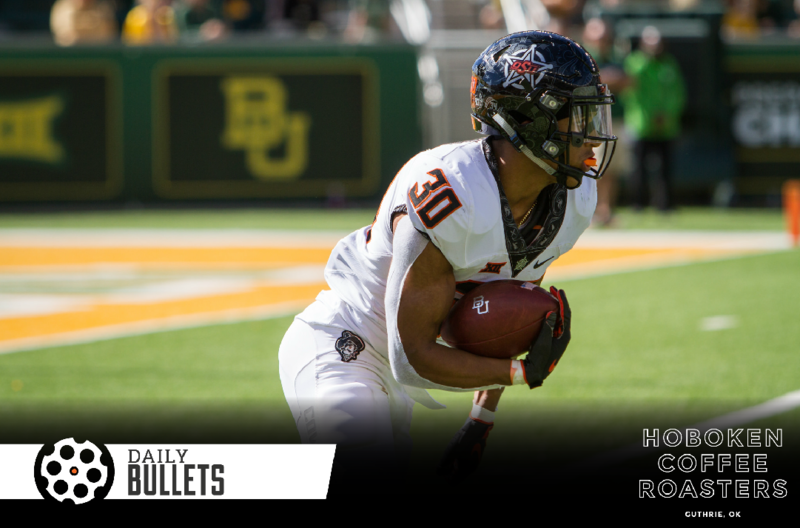 OSU’s young safeties, as Porter wrote in his 10 thoughts, were pretty great against Baylor! Kolby Peel and Malcolm Rodriguez were excellent overall. But as Jenni Carlson of The Oklahoman noted in her post-game grades, nothing much else was all that swell, including two F grades. Here’s one for the much-discussed D word: Discipline. Ashamed is a strong word, but it’s hard to argue the grades aren’t fair. OSU was as undisciplined as me with a bowl of queso in front of me on Saturday — a theme that has perpetually plagued this squad — and it doesn’t appear to be getting better. In fact, somehow things have snowballed from awful to downright atrocious. 10 notable stats from OSU’s loss to Baylor, including this gem: Justice Hill’s 119 rushing yards against Baylor pushed him to 3,504 career rushing yards, passing Tatum Bell for seventh in program history. Blind recommending this bookmarked Klay Thompson feature from GQ before I read it: I’m positive it will be nothing if not interesting. Stephen Curry is the ultimate one-off. We may never see another quite like him.